For use with the Siemens 8825 Gigaset 2.4 GHz 2-Line expandable cordless communication system, this supplementary handset expands your office communications capabilities. 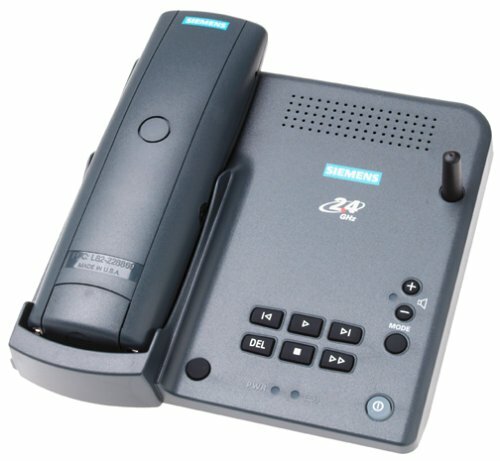 Since the 8825 is expandable to eight handsets, your whole staff can make use of the 8800's wide range of features, including a full duplex digital speakerphone; access to the answering machine; and a bright, easy-to-read backlit LCD that shows caller ID/call-waiting information (requires subscription with your local carrier) and a directory of your 120-number speed-dial presets. Additional features include convenient call transfer, conferencing, consultation call, intercom, call log, and room monitoring. This lightweight and comfortable unit weighs just 7 ounces and has controls for volume, call waiting, flash, and last-number redial. It is powered by two AA rechargeable NiMH batteries (included), providing eight hours of talk time and eight hours of standby. A headset jack allows for hands-free conversation. I originally bought the 8800 series because I do lots of conference calls and needed a digital duplex speakerphone. This phone offers so much more however. One feature that we didn't know existed but have used constantly since we purchased is the voice announce for caller ID. I can be in the kitchen and the phone rings and then my voice comes on and annouces "The Smiths" from the base station. We answer that one. Or "Caller ID Unknown". Probably a salesman, no need to get up from dinner for that one. It has caller ID based mailbox routing, call barring (to prevent the phone from ringing at all if someone calls who has deliberately blocked their caller ID from being seen), individual phone intercom, 'all house' intercom, and the room monitor with call forwarding works great as well. There are too many features here to learn in one sitting. We have had two problems. Every once in a while the cordless handset has a clicking in the background which I believe to be related with some other 2.4 GHZ appliance interference. If you could manually overide the channel selection, I think that would not occur. It is a rare occurance but I think preventable with the right options. The other problem has been just finding two more cordless phones. These are hard to find. I would highly recommend this phone. I have owned a base along with 2 handsets for over a year. I just added 2 more handsets. Over this time the system has performed very well in fairly constant use, even in a harsh environment with a lot of construction dust due to remodeling. I have not had any trouble with the batteries (they are inexpensive AA 1300mAh NiMHs, so if they do weaken, no big deal), nor with the user interface, nor have the handset buttons failed or even started to give any trouble. I haven't had the occasion to call Siemens tech support so I can't say whether they are any good or not. People who are getting a lot of clicking are experiencing interference with another 2.4GHz piece of equipment, and the clicking is a symptom of the system trying to compensate and failing. The usual culprit is a wireless LAN or another 2.4GHz phone system. This can be really irritating if you are trying to use the phone for important calls and can't control the source(s) of the interference. I discovered the cause of the clicking noise quickly when I accidentally fired up a WLAN gateway a foot from the base station and the phone became VERY noisy. Later I changed the preferred channels and the location of the gateway and the systems cohabitated nicely. Still, at our last house we experienced a lot of uncontrollable interference from many nearby neighbors; our current place is further out in the country and doesn't suffer from the problem, so the phone is less noisy here. Overall, I have found this to be an excellent system with the noisy frequency-hopping to be the only drawback. From the other comments here I have concerns about its long term reliability, but so far, so good. I have a set of three Siemens 2.4 GHz phones (my mistake to buy all at once). They have had problems from Day One. I have had to return them to Siemens -- only to get the same problems back. None of their recommended fixes have worked. And worst of all, customer support has been atrocious. I recommend not buying these. I bought two other 2.4 Ghz phones from AT&T, and they have been flawless in the exact same environment. I've owned the Gigaset 8825 system and 4 8800 cordless phones now for about a year. In general, I'd agree with most of the reviews. It is a great phone system and generally, I really like the features. I have only one big problem. I can't find 3 of my cordless phones. With two teenaged daughters, the phones seem to be popular after school (and into most of the night). The thing is, they seem to forget to put them back in the charger. The standby power on these things is not all that great. The specs say 80 hours, I'd give it a little more than 8. I've replaced the rechargable batteries a few times, but that doesn't seem to help. Usually, I find these things, but for some reason, they are being very illusive. When they have power, the intercom Call All feature lets me find them easily, but when the power is gone, they are small enough to hide in sofa cushions (looked there), under beds (looked there too). I'm about to offer a reward, teens always need money. The Siemens Gigaset 2420 offers a full-featured multiuser phone systemfor growing offices and hip households. The base package includes a two-linedesk phone that serves as the master station for the system, as well as one 2.4GHz cordless handset (model 2400) with its own charger base. Expanding thissystem is simply a matter of purchasing additional cordless handsets (up to atotal of eight) and registering them with the desk station. With its stylish,understated look, the Gigaset 2420 will be a sharp addition to any office. Thedesk station features an uncluttered control panel that uses bright red lightsto alert you to line use, caller ID callers, voice messages, and access to voicemail services provided by your phone company. Siemens makes the most of the two- line LCD display, consistently dishing up very informative menus and callinformation. There are only four speed-dial buttons, but the system includes abuilt-in scrollable phone directory that you can easily scroll through to movecaller ID entries into the directory. Transferring calls couldn't be easier;pressing the "Int" button displays a menu of extensions, complete withnames. The cordless handsets are small and light, and incorporate a surprisingamount of local functionality. The handset's control panel is very consistentwith the desk station; in addition, some of the functions are wisely implementedthrough two double-position buttons that control soft menus on the LCD display.This gives remote users a look and feel similar to mobile phones, including theflexibility to customize ringer volume and pitch for both external lines and theintercom. The 2420 system can support two external calls, as well as aninternal conversation between two handsets, for a total of four active handsetsat any given time. The cordless handsets store their own local phonedirectories, and you can send directory entries to other handsets or to the deskstation. For the wandering user, the cordless units also provide an audible out- of-range warning. During our tests, we found the Gigaset 2420 packageintuitive and its handset comfortable. The system was easy to set up. We simplyplugged in the phone line, installed the batteries in the cordless extensions(they accept either ni-cad or NiMH), charged them, and registered the cordlesshandsets with the base by following a quick, well-documented procedure. Thestandard ni-cad batteries (included) provide about four hours of talk time, andthe optional NiMH batteries provide about twice that. We recommend returning thehandsets to their chargers at least every evening. The standard belt clip andheadset jack made the cordless units perfect for our users on the go. One of the2420's strengths--its small handset--was our only frustration. We found both thedesk handset and the cordless extensions difficult to cradle on our shoulder.Old habits often die hard. Overall, this seems to be an excellent system. First, let me correct a few inaccuracies in the other reviews. Mr. Mehlman states that you can't repeat or skip messages in the answering system remotely. The manual clearly states that you can. He also claims that you can't play back messages from the cordless handsets, but the manual also says that is possible. Mr. Szymonik and Mr. Doumet both claim that you can't transfer phone directories between the base and handsets, but I have done just that. What don't I like? First, there are no voicemail boxes in the answering system. Each line can answer separately, but you can't have boxes for different people on the same phone line. Second, while you can control the ringing frequency and volume for calls placed to different lines and the intercom, you can't change the ringing pattern. I would like one long ring for Line #1, two short rings for Line #2, and three shorter rings for the Intercom, for example. Third, the desk unit handset is so sleek and rounded that it's difficult to hold between your ear and shoulder. Fourth, the phone's user interface isn't intuitive at times or even consistent. For example, to add a new entry to the directory or send the directory, you hit the Dir button, then have to select a name, then scroll through the action list to find the appropriate action. Selecting a name should not be required for global actions. As another example, to page another intercom station from the handset, the menu shows the extension number and part of the name, but to send a directory to another station, you must enter the number without seeing the names. However, except for the lack of voicemail boxes, these are fairly minor issues, and should not detract from the review. Users rate this product as excellent or junk - why? 2. Reliability - Siemens has had ongoing quality problems. This explains why some users rave about the phone and others complain severely. Both groups of users are reporting their experiences accurately. I've experienced both excellent performance and lousy performance with my phones. the base unit was replaced once. I have replaced two handsets. I just ordered third handset replacement (LCD failed after a week). Siemens warrantly replacement is straightforward, fast, and cost free (they pay shipping). They don't even ask for proof of purchase. But I strongly suspect they have had so many quality problems, that they gave up trying to ask for proof of purchase. There's a never ending supply of refurbished Siemens phones for sale. It seems they've had long run of quality problems, only to exascerbate them by recycling the phones through the refurb program. They need to destroy these phones, rather than refurb and recycle them. A refurb is what you get as a warranty replacement. I fully expect to be replacing these phones every 1-2 months until my patience runs out. Unfortunately, no other vendor makes a comparable 2-line phone. Yes, I tried the Panasonic and found its functionality was sorely missing in critical areas for me. For the price and reliability the Gigaset 2420 phone is a rip off. I purchased one new at considerable expense a few years ago. The LCD screen failed during the warranty period. The LCD on the replacement phone failed. I purchased several of these units used. Every LCD has eventually failed. The portable handsets still work, but are useless without the base. I invested a fair amount of money into handsets, and they are now worthless. Totally unreliable base unit. 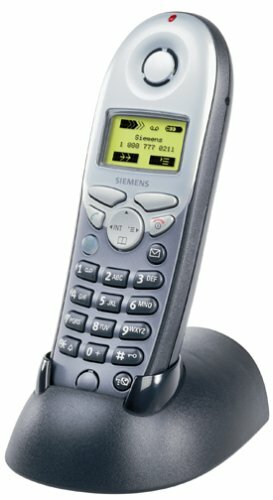 Don't buy Siemens, as you can't get parts from them and they do not support the phone. Good phone for the features... but with some quirks. I've owned one for several years and can't find anything better that has the features I want. 1) The desk station would shut down on the second ring of an incoming call. All the buttons would light up red and the LCD display would be all blocked out on the second ring. It would then reset itself and repeat the process on the next incoming call. Workaround: Clear the caller id log. Why this works? I don't know... but I stumbled on it by reading the various online reviews and trying things out. Must be a firmware bug. 2) Microwave ovens, amoung other things, cause interference with the cordless handsets. Some cordless handsets are better than others. Possibly quality control issues. Workaround: Pickup a second cordless phone and then hang up the one you were talking on. When a second cordless handset is in use at the same time, it must use a different part of the 2.4 GHz bandwidth. Siemens tech support was no help. If you are looking for good tech support then don't buy this product. Is tech support for all Siemens products like this? Don't know. This is a great phone system. 2 lines, up to 8 handsets, voice mail, intercom, conference calls, etc, etc. So why 1 star? When it breaks, you're SOL. I've had my system for 4 years. Had a few minor problems, Siemens tech support helped, replacing a defective handset in the first few months. I was happy. All of a sudden, 3 months ago, all the handsets started having intermittent problems where the sound was garbled, in a digital sort of way (no static, just parts of conversation coming in and out a few times per second). I contacted Siemens, and their response was "mechanical problem with handsets, we won't fix it, buy new ones". Huh? Mechanical problems, like you get when you drop a handset? But this problem started on all handsets, at once, and is intermittent. Doesn't sound like a mechanical problem, in the handsets or the base. More likely it is a problem with the firmware in the base unit. 1. Buy a refurbished base ($130), and perhaps get the same problem 6 months from now, 'cause the firmware is likely the same, and Siemens will continue to insist the problem is a mechanical problem in the handsets. In 6 months, tech support for 2420 will probably be worse than it is now, and if refurbed units aren't available, I'm SOL. 2. Buy a new base and handsets ($500). Since Siemens hasn't even admitted a fault with their 2420, how can I have confidence that they fixed the problems with the 8825? And if there is a problem, I'll get the same lousy support and incompatibility once the 16300 (successor to 8825 - just guessing on the number) comes out. 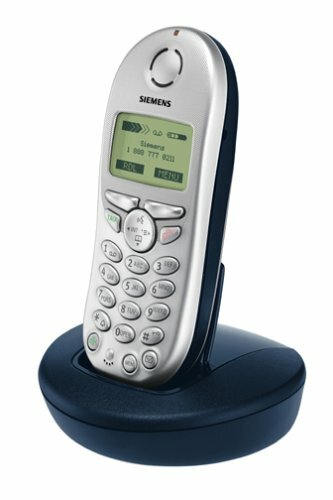 Expand your Siemens Gigaset 4215, 4210, 4010, or 4015 system with this convenient 4200 supplementary handset. The 2.4 GHz digital technology extends your communicating range, and a well-chosen suite of features makes it ideal for small office or busy home use: six-day standby battery, clock and alarm, appointment reminder, and a navigation key to help you move through the intuitive menus. A 30-number caller ID memory and 200 speed-dial presets are both displayed on the large five-line backlit LED screen. This slim handset, weighing just 5.6 ounces and measuring only 2-by-6.5-by-1.5-inches, has volume control, call waiting, flash, hold, and last number redial. Purchased this phone to use as an additional handset to the Siemens 4215. 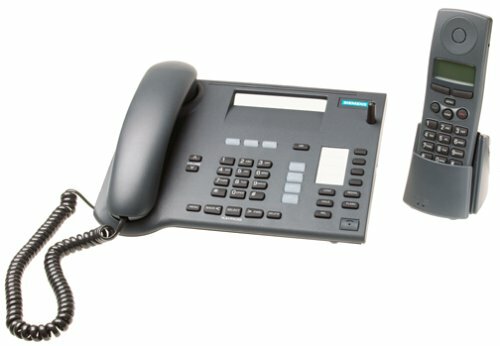 For those not familar with the Siemens system - up to three of the 4200 series handsets can be used to expand the 4215 base system. You can have phones (4 total)all over the house without the cost of adding wiring and new jacks. I am able to walk to a neighbors home on the two acres next to mine & make/receieve calls with prefect clarity - even inside! One more thing - this phone takes two regular AA rechargeable batteries, so no more expensive batteries that sometimes can cost more than the original phone. I had reseached cordless phones for over a month and although the Siemens 4200 is not the best phone on the market, it's definately alot of bang for the buck. Here are a few features I use the most. -(Personalized Ring volmue settings) The volume can be set to specific times of the day. For example, I have it on the lowest setting from 11pm to 9am (Sleeping Hours), so if I receive a call, I'm not startled by a loud ring. After 9am, the handset automatically adjusts to a normal ring volume level. -(Intercom) If I'm in the garage, I can call the other handset in the house. -(Handset Speaker Phone) Most cordless phone systems have a hands free speakerphone on the base. The 4200 speakerphone is directly on the back of the handset which you can carry with you. In my opinion, this is the best feauture of this phone. There are many other features that I probably will never use, like the baby monitor, but it's nice know that they are availble if I need it. As for my four star rating, the one thing this phone doesn't have is backlit numeral buttons. In the dark, it difficult to see the numbers. However, if your contact is in the phone book directory, you simply select it and the phone dials it for you. Overall, a great phone for the money. I have a set of three of these phones (my mistake to buy all at once). They have had problems from Day One. I have had to return them to Siemens -- only to get the same problems back. None of their recommended fixes have worked. And worst of all, customer support has been atrocious. I recommend not buying these. I bought two other 2.4 Ghz phones from AT&T, and they have been flawless in the exact same environment. The ideal companion for your Siemens Gigaset 4010, 4015, 4200, 4210, or 4215, this Gigaset 4000 supplemental handset offers versatile 2.4 GHz digital technology in a lightweight, comfortable package. A 100-number phone book and your five most recently dialed numbers can be displayed on the large, five-line, backlit LCD screen, and the handset menu operates in 14 languages. Extend your freedom with hands-free speaking and open listening, plus room monitoring. The space-saving desktop charger has a pager to help you find the handset. The long-life battery offers 20 hours of talk and 300 hours of standby, plus a low-battery indicator. Was looking for an easy solution to phone quality and ease of use with an integrated answering system. Persistence in reading the documentation thoroughly was key in setting the phones up properly. The quality is really far and away much better than any other phones I've used. I love quality stuff so this fit me to a T. Price was good. So far, after about 6 months we've had no problems. I am a very satisfied customer. Well, first to the reviewer "m_night2" from Savannah, who said you can use "regular" AA batteries in this phone... that is NOT true. The manual explicitly says that you CANNOT do that, and that the batteries must be NiCD or NiMH rechargeables. This is probably the reason he had trouble with his phone, because regular AA alkaline batteries are different voltage and milliamps than NiMH rechargeables. Use the right batteries and these phones work great. Siemens raises the bar with the 8825 Gigaset, a 2.4 GHz two-line expandable cordless communication system. Expandable to eight handsets, the 8825 offers a wide range of features, including a digital answering machine with four mailboxes. The voice-announced Caller ID (with subscription to service through your local carrier) uses your voice to announce incoming calls. Caller ID information and a directory of your 120 speed-dial presets are displayed on an easy-to-read backlit LCD. Siemens includes an extra handset (model 8000 Gigaset) with charger. The lightweight handset provides call transfer, conferencing, intercom, and room monitoring. It weighs just 7 ounces and has controls for volume, call waiting, flash, and last-number redial. Two AA rechargeable NiMH batteries (included) provide eight hours of talk time and eight hours of standby. The base and cordless handsets provide digital speakerphones and headset jacks for hands-free conversation. Additional handsets require no extra phone jacks. A built-in answering machine completes the system. It has four mailboxes, date and time stamp, individual announcements for each incoming line, and 45 minutes of recording time. The unit also supports full remote operation, so you can collect messages while you're away. I have a Siemens 2420 system with 8 handsets. I have sent several in for repair with not much improvement. The handsets constantly drop out in the middle of conversations. The noise in the earpiece is terrible and the person on the other end of the line cannot hear you. I emailed Siemens about this and they admitted that they had a problem with the handsets' shielding which caused the dropouts. I then asked if I could get some kind of credit towards their new model since I had spent a small fortune buying the base and all the handsets for teh 2420, but they would not do that. Why would I trust them with this new system when they will not support the old one. At least they should have redesigned the handsets so that we could use the system. I am stuck trying to decide what to replace my 2420 with. The one thing that the Siemens has going for it is the features. Unfortunately, if you cant use the phone, they are useless. The phone looks decent enough, but performs miserably. I love the base unit (not enough cordless systems have a corded base unit). 1. The absolute worst thing about the phone is the sound quality. There is a constant clicking in the earpiece of all of the handsets. It's like you are holding a bowl of Rice Crispies up to your ear while trying to talk on the phone. 2. The range seems at least average. It works fine in the back yard 150-200 feet from the base. (Fine being a relative term, considering you still get the same snap, crackle, and pop). 3. The only redeeming quality is the speakerphone on the handset. You can hear well, and nobody on the other end seems to be able to tell you have them on speaker. 4. One of the most annoying things about the phone is the beep it makes to indicate low battery (or when you put it on the cradle to charge, see below). The beep is one of those sounds that you can't immediately tell where it is coming from, and while not very loud, seems to permiate walls better than most sound. This would not be too much of a problem, if the phone beeped once or twice to indicate low battery, but no, it beeps every 10 seconds or so until you put on the charger or until it dies. I can't even estimate how many nights I've had to get up out of bed and find the phone that was low on battery. 5. This may be unique to me, but one of the handsets or cradles that I had was not made right. When you put the handset in the cradle, it would lose contact with the charger and stop charging. It would then find it again and begin to charge (beeping each time it reestablished contact). It would do it very regularly, and I finally resorted to taping a piece of paper to the inside of the cradle to help the phone sit straight and not lose contact. Absoloutely terrible phone. Get the Uniden. I did, and It's infinitely better. Even if it doesn't have a base unit with a corded phone. I bought my 8825 about 18 months ago. It has worked well in that time, except that it cannot survive power surges. About 8 months ago, there was a power surge in my house that damanged the base unit. The problem was that line 1 of the base unit would go off hook, and stay off hook. I got around this by using only line 2. A few days ago, another surge, and line 2 now shows the same symptoms. I have many other pieces of equipment in my house that interface to phone lines, and none of these were taken out. I will sell my cordless handsets on eBay, and I will look for a new system from another manufacturer. Have had a 2415 for about 11 months, it has worked perfectly up till yesterday. When I tryed to log on to the answering machine (using the int button), the display shows "No Channel Available". I reset the base and the handset. The reset went well and registered properly. I was happy until I tried the answering machine again and got the same message. Now I can't even use the phone as it says the same thing when I press talk. Patiently, I tried to called Siemens. Their free 800 number for this unit is now a long distance call. About 3 years ago I bought a Panasonic 2.4ghz set and put it aside for this one (I was blinded the Siemens slick looks and the European name). Well, I pulled out the old Panasonic, charged the totally dead battery and guess what? It works like a charm. So what do you think, anyone wanna buy a Siemens on eBay or Amazon? I'd sell it but I am an honest person. Siemens's 4215 Gigaset covers a lot of ground. By using the walkie-talkie function, you can contact anyone who has a handset within 1,000 feet outdoors and 150 feet indoors. With long-ranging 2.4 GHz digital technology, the lightweight 4215 offers features like voice-announced caller ID/call waiting and headset compatibility and speakerphone in an expandable unit. Plus, enhancements like a buttonless base, six-day standby battery, clock and alarm, and appointment reminder combine to make this phone well suited for a small office or busy home. It's also easy to use, with voice-activated commands and dialing and a navigation key to help you move through menu options. The built-in digital answering machine provides 33 minutes of recording time (and memo operation), with the support of four mailboxes to designate messages and full remote operation to collect messages while you're away. The date and time stamp records when the call came in. A 30-number caller ID memory and 200 speed-dial presets are both displayed on the large five-line backlit LED screen. The slim handset, weighing just 5.6 ounces and measuring 2-by-6.5-by-1.5 inches, has volume control, call waiting, flash, hold, and last number redial. This phone is so simple to operate and very user friendly. All functions are simple and easy to remember. Phone battery life is excellent. Speakerphone is very cool. From the handset you can talk as if you had a speakerphone - clarity impressive. Voice announcement is very cool. You preprogram names with your own voice and when that person calls it is announce with your own voice. Only downside so far is that their are only 20 slots to store voice recognition. This phone does it all. Since there are too many functions to list. I will mention a few of my favorites. 8. Multiple handset add-on feature is great for expanding. 3. The programming of all the features may be a little complex for your average user. Keep in mind, the positives definitely surpass the negatives for this product. I highly recommend this phone system for any one looking for a phone that will do it all. This phone was a replacement for a Panasonic 2.4 GHz cordless that I've used for 6 years. I read all the reviews and decided to get the 4215. I have not been disappointed thus far. Its features are great (though many in number, so lots of menu clicks at times). It's similar to a cellphone in operation and menu structure. Call quality and message quality are great. I love the musical ringtones! With a second handset I can call between the handsets for intercom capability within the house (nice for when I'm in the basement and everyone else is on the second floor). I've read elsewhere that people have had trouble with battery life. Since a lot of people don't properly charge the batteries initially, I thought this would not be a problem. Indeed, initially I had 4-5 days of battery life. But after 3 months the battery life was down to about 2 days. So I got 2 new AA-size NiMH batteries. After I got them I noticed that the stock NiCd phone batteries are 700 mAh, whereas the Energizer NiMH batteries I purchased are 1850 mAh, i.e., over 2.5 times the capacity. We'll see how these work. I took one star off because they went with the cheaper batteries (for a more expensive phone), there is no headset outlet (although I don't use that option very often anyway), and the handset is tapered at the top so it may fall out of your hand before you get used to it (ergonomics issue). The base appears to be geared towards table top usage, since I don't see how it can be attached to the wall. But the footprint is pretty small anyway, so no problem for me. I have owned this phone since it was introduced in the U.S. I have owned this phone since they introduced it in the United States, so a little over 3 years. My system consists of one 4215 base unit and 3 of the 4200's. 1) You will either love this phone or hate it. 2) Don't buy it for Grandmother - it will totally confuse her. 3) Replace the batteries that come with the unit IMMEDIATELY with something like Maha PowerEx NiMh 2200mAh Rechargeable - you will be amazed how long a charge will last. 4) I love the fact that it takes AA size batteries, not something that will cost more than the phone to replace and is impossible to find. 5) The range is fantastic! - I live on 2 acres and can easily walk to my neighbors home and still make and receive calls as if I were in my living room. 6) If your power is out the system will NOT function. Keep a standard telephone plugged into one of your outlets to be safe. But this is no different than most units. If there is no power they will not transmit. 7) Yes there is a delay in the keypad as others have mentioned it is very minor and I pay no attention to it. 8) It would have been nice if the phones had a headset plug built in. 9) The speakerphone quality is excellent - one of my favorite features. 10) Keypad lock is nice if you want to put it in your pocket and work outside or walk up the street to your neighbors. 11) Very well made, mine still look like new even though they have been dropped and mishandled. 13) The standard ring tone is unique (european), the others are melodies - you may or may not like them. 13) You can set the phone's ring volume to a lower or different tone for specific hours. For example midnight to 6:30 am. 14) Room monitor is a nice feature. This sleek handset for Siemens 2.4 GHz expandable phone systems (required, sold separately) lets your existing state-of-the art communications center grow with your needs. Compatible with the SL3501 and all 4000-series models, this comfortable handset offers a five-line LCD screen for clearly legible control of caller ID and your digital answering system, if your base station supports these features. Caller ID memory encompasses an impressive 200 stations, all of which you can access for one-touch dialing. Or, use voice-activated speed dialing to effortlessly call friends, family, and business associates. The 2.4 GHz band provides increased range, up to 1,000 feet of outdoor roaming; inside, you can wander up to 150 feet away from the base. The NiMH battery provides an average of seven hours of talking time or up to 130 hours on standby.Use with other handsets to transfer calls between stations or to change calls from external to internal. Siemens includes a one-year warranty that covers parts and service. I had a different SpeedStream router for about 10 months when it crapped out on me. I sent it in to the manufacturer and about a month later they sent me the Powerline version of their product. I had a lot of trouble setting it up and since their tech support is only open from 7 to 7, I waited a long time to be able to call them for help. Just yesterday, after three months with this new router, the wireless capabilities stopped functioning. Of course, I had to go into work late so I could call their tech support to find this out. So my router is now worthless to me. Luckily it has been 13 months since the purchase date and my warranty is kaput. So I am now in the market for a new router. I guarantee I will never by another SpeedStream product. Crap Crap Crap! This worked like a charm - I'd read the mixed reviews here of the Powerline ( HomePlug ) performance in these Siemens systems. But, (even with a separate aftermarket CanTenna attached and aimed) I was getting no usable wireless signal from my Siemens 2524 wireless router in a separate building nearby, so I decided to try the HomePlug feature, and got a SS2521 WAP. Ran the included disk, plugged in the 2521 item when prompted, and bingo - 99% signal strength, 100% link quality. And, contrary to a review I read here, it is NOT necessary that this SS2524 router be on the same electrical circuit as the WAP. In my location, the 2521 WAP is not only on a wholly different circuit, but in an entirely different building from the 2524 router, and it works perfectly. (This building is on the same side of the electrical meter as the router - I understand the signal will not cross a meter.) So, now we have perfect, full-strength wireless service literally anywhere there's a power outlet! The unit worked flawlessly out of the box. No hassle. It connected with other powerline accessories in areas where wireless could not reach. Great product. Received the unit yesterday, went to CompUSA to purchase an el cheapo wireless PC Card, had everything set up in 25 minutes. Using laptop + wireless card <----> SpeedStream 2524 now to write this review, I'm downstairs and down the hall from the SpeedStream and have excellent conection. Haven't tried the PowerLine connection yet but plan to in the next month... (NOTE: for all HomePlug/PowerLine devices -- do not plug them into fancy power-strips/surge protectors/UPS!!). It was easy to get this unit hooked up and the wireless network running -- just follow the quick install instructions and it works. Once it is installed, you need to configure it which is pretty straight forward. Clear and easy to use menus that are accessible from a web browser -- for someone with a bit experience configuring home networks, it was very easy. However, my Intel-based wireless Wi-Fi card did not find the wireless, but I found a note in Speedstream's knowledgbase to change the preamble settings in the card which fixed the problem. Strange, though, while the note claimed you had to make the change in Linksys units as well, it worked without a change with the Linksys Wi-Fi router. On the negative side, I found some major deficiencies with this unit: It did not recognize any of my Linksys gear -- neither the print server nor even a basic switch, whereas my Linksys router recognized this router as part of the network. Equally disappointing, while Linksys' router software shows me all units with their IP addresses on the network, this router only displayed PC's/Notebooks and not print servers or other networking gear. And even worse -- it never found the Speedstream Powerline 802.11b adapter that I wanted to use to install a second access point (and which was the reason to get this router in the first place, so I could connect the two access points via a powerline). And since there is not a single way to debug the Powerline adapter you could not even figure out what was wrong with it. At the end, I had no choice but to return the gear. Worked right out of the box for me. The literature for configuring the "network" password is wanting, but with the help of a web search I was able to do it. I bought the SS2502 and the SS2510. They work fine. Never a problem. They are fast and reliable. I'm going to buy more SS2502s. A great, inexpensive way to wire the house. I bought the 2502 powerline ethernet connector and the 2521 powerline access point. I was adding them to a network which is using two NetGear XE-102 powerline connectors. The Netgear products installed instantly without any software (except to add encryption, if you want). After several hours neither Siemens/SpeedStream product worked. Passwords are required for each device. You have to match to the default settings on the access point for all your devices. Forget it. It's a nice idea to have a powerline access point and I hope Netgear develops one. The instruction booklets are cryptic and useless. I originally decided on this item because of its inexpensive price. And the fact it was Siemems/Speedstream. It was everything I expected. I just plugged it in, connected it to a HUB and viola, ethernet available in any room. It's inconspicuous. I have one in the corner of my living room connecting to my Airport Basestation. Makes a much better location for the wireless. Just moved to new home; bought two Ethernet adapters, one connected to router and one to my office PCs (via hub: XP Pro, 2000, Linux), and a USB adapter for game PC (XP Home). I am now waiting for wireless version for family room / kitchen so I can connect wireless laptop & TiVo. Sharing cable broadband across first two was seamless. The driver install for USB on game PC took a couple of tries to get it to work but no trouble since. I tried moving Ethernet adapter to basement and other outlets and it worked as expected. I've used this unit for 2 years and have been very satisfied with its performance. Another reviewer mentioned the need to reboot it "a couple of times per day". That has NOT been my experience. In two years of use, I have rebooted only once every six to nine months and even then I suspect the problem was with the DSL service. I use this unit to connect 5 computers to the Internet and even with all five systems online at once, the performance is impressive. I bought my SpeedStream Wireless USB Adapter almost an year ago. I had issues about the reception, because I already tried the NETGEAR one. I had no reception with the Netgear products and when I plug the Siemens one, I was surprised. I got 60 to 66% signal against 0% by Netgear. Bottom line is that I advice you to choose this product if you want to be most satisfied from using your internet, or network at all! My router is Linksys BEFW11S4. After trying Netgear wirelss USB adapter and Microsoft wireless PC card, I bought this Siemens USB adaper. It begins to work smoothly on my Windows XP laptop right out of the box. The range is also good. The requirements say that it will work with Windows 98SE. I tried two different computers with windows 98SE and it didn't work with either one. I spoke with the tech support and they didn't know anything about it not working with 98. They were no help. I tried it on ME and 2000Pro and it worked perfectly. Very easy to install on anything other than 98. As long as it is not on 98, it works great and I am really happy with it. The range has been great, at about 30 feet through 4 walls I get full power. Comes with a long usb to be able to place it where ever is best. Worth the money. Make sure that you installed the right driver. updated driver is available on the website of the manufacture. On the other hand, Windows XP has a built-in software module to control wireless device. You can choose either of them, Windows built-in software or configuration Utility provided by manufacture, but make sure which one is actived. I just want to tell you that you don't need to feel frustrated if you can't set up your device. You may block the utility that you are trying to use. This is the most sensitive device comparing to other brands. I've been using this product on my laptop for about two years now and I've never had a problem. The Cat5 plug is sturdy so that it won't get broken like on some other models. I've used this product on Win98 and Win2k and it worked fine on both. I purchased this product a month ago, does not work at all. Technical support was horrible, I finally decided to return it. Installed in less than a minute, and has been working perfectly. Quick install guide is small, but easy to follow, and clear. Sturdy end connect for cat-5. I am using this on the kids computer rather than installing an ethernet card. It is hooked up to a router in order to share a broadband connection. It is on a Windows ME machine. When I plugged it in it prompted me to load the drivers, loaded them, rebooted, and worked right away. I later had some problems with the dialer from our old dial up ISP interfering with the broadband connection, but removing the dialer solved them. I definitely would recommend this item. With Siemens's 4015 Gigaset, you'll enjoy the convenience of both a cordless telephone and a digital answering system, so you can leave the house and still stay connected. The system collects your messages and tracks callers with caller ID. Expandable to a total of four handsets (one included, up to three optional, models 4000 or 4200), the 4015 also lets you communicate walkie-talkie style with other family members or office colleagues up to 1,000 feet away under ideal conditions. With long-ranging 2.4 GHz digital technology, the 4015 provides lightweight communication and clear sound. A 30-number caller ID memory and 20 speed-dial presets are both displayed on the large, backlit LCD screen. The compact handset weighs just 5.6 ounces and measures 2 by 6.5 by 1.5 inches. It has volume control, call waiting, and last-number redial functions. The integrated answering system provides 15 minutes of digital recording plus time/day stamp and a memo function. You can check your messages while away from home with remote retrieval. The compact base is headset compatible. A long-life battery is included, offering up to 10 hours of talk and 200 hours of standby. 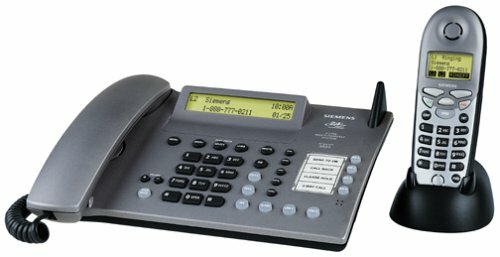 Siemens 4015 Gigaset - A great phone system! I purchased the Siemens 4015 Gigaset for my parents to use in their home. My 71 yr. old mother programmed this phone simply by following the step-by-step process that is very clearly shown in the manual. To anyone with an average level of intuition, you can program this system without even using the manual. Voice quality is excellent and there is no noticeable static when using the handset around the house. Outside of the house the phone begins to break up a little at about 150'. The intercom feature is ideal for my parents because they can carry the handsets throughout the house (or outside in the yard) and always be able to call the other for assistance without having to yell for help. It's also nice to be able to use standard AA batteries in an emergency..
Having no controls for the answering machine at the base is no issue. It's no different than using voice mail from your phone company, and having message access from the couch is great in my opinion. There is a speaker in the base station too, and as long as you set the volume at maximum, it works fine. You can use the speaker to screen calls or to listen to messages. This system is about $100 less than the Panasonic and every bit as good. I also looked at VTech, but for the same $$ I elected to go with Siemens for the quality of construction. My only gripe is that I don't care for selection of melody-ringers that come with the phone. Only 1 of the 10 melodies is tolerable. And, for the reviewer that complained that there is no paging for lost handsets, look at the bottom of the base station. There is a button there for exactly that purpose. I love this phone system! Buy it with confidence. After seeing the mix of reviews on this product and the other brands of cordless phones/answering machines as well, I took the plunge and went for the 4015 and an extra handset. The negative reviews sounded to me to be environmental problems. I do not live in a dense urban area, I do not have a home computer network and I do not run the microwave oven much. My phone does "click" when the microwave is running, but I have a few solutions to dealing with that: don't turn on the microwave when the phone is in use, don't turn on the phone when the microwave is in use, take the phone out of the kitchen if it is imperative that they both be used at once, or simply listen to the click for a few minutes. It's not that bad. For me. Reception throughout the house has been wonderful and I can wander in the backyard with no loss of sound quality. Cons: The ring tones are really stupid. I remember when phones actually had bells in them. Now it sounds like there are cell phones ringing throughout the house. The base has no provision to mount on the wall. Since there are no controls on the base, why clog up counter space? The handset menus are not great, but after four brands of cell phones, none of them were really great either. One other bad thing: the handset doesn't have a cord. My wife still wanders around the house with it and leaves it hidden. Pros: It's a phone. It works - people can call me, I can call them, they can leave messages. I use it as a consumer product, not as a business tool. I don't have a huge house or a large estate so reception has not been a problem. The base is nice and small, much smaller than our previous analog answering machine. I like the feature of having all of the controls in the handset rather than on the base. Other: I bought an additional handset and had a bugger of a time getting the handset to register to the 4015 base. I called Siemens customer care and they helped me out. The spare handset must be placed in the 4015 base once, not just it's own cradle (doh! )in order for it to be recognized. I bought this phone because a colleague of mine had one, and I liked the idea of being able to listen to my messages on the answering machine privately without them being blared to one and all. So even though it was a fairly expensive telephone, I talked my husband into getting it for me one Christmas. After only a few months, though, the base failed to communicate with the handset. I was able to fix it myself following the trouble-shooting procedure in the user's manual, but after another couple of months the same problem occurred. This time I couldn't fix it myself, so I called Siemens customer support. They had me try some things, still to no avail. They then sent me a new phone. That one worked for another couple of months, and then the base stopped communicating with the handset...again. So I again called Customer Support, and this time they were not so helpful. I was on hold for a very long time, and then when I got through, the guy told me I had to follow a procedure, wait 15 minutes, and call him back. When I finally got through to them after the 15 minutes, it emerged that he had gone home and obviously had just told me to go through this rigmarole so he wouldn't have to help me any more. I would have preferred just being told that right up front instead of being on hold for upwards of half an hour! They never did figure out why I was having problems, and because I was now past the original warranty period they informed me I would have to buy another phone. So I gave up in disgust and bought an AT&T model for half the money that is much easier to use and works perfectly. And guess what? I found out after using the Siemens model that I don't even LIKE the feature of listening to messages through the handset! It turns out to be more convenient to have both hands free for writing, putting away groceries, etc. while listening to messages than having to hang onto a handset. Oh well. Live and learn. I've had this phone now for over 2 years and haven't felt it was the best investment. Like many consumers I like the convenience of a cordless hand-held phone, however like some of the previous reviews, it isn't comfortable to hold between your head and shoulder... in fact, it's almost down-right impossible! The battery life is frequently short and will cut you off right in the middle of a call. If you are in the middle of a call while the phone is in the cradle a slight move will sometimes end the call prematurely. The headset is awkward and uncomfortable and the sound quality on both ends of the call is sometimes awful. I've heard static almost consistantly on the headset. The buttons are somewhat hard to use since they seem to work then not work sporadically and have a delay between pushing the number and actually dialing. I really dislike the ringing tones - like an annoying cell phone from the early 90s. And the volume is also lacking in choices, there just aren't enough settings to get the volume loud enough on the headset. If I could, I would replace this phone with a Bang & Olufson. Good overall, but one key problem. I just discovered in another review here that there truly is no mute function. I had been searching the Web for advice on how to do just that. With small children and regular concalls, I need to be able to mute. Ack. I am happy with this phone otherwise. 2. No mute button. Terrible if you use the phone for work/meetings. 3. Limited speed dial. I like to program access codes (like mailbox number and password), since I use my phone for work purposes. I can't do that with this phone. 4. The buttons are not very responsive and there is a delay until you hear a "beep" indicating that you pressed a button. Sounds petty but the result is that, when dialing, you often miss a number but don't realize it until it's too late. Then you have to start over. 5. The size and shape of the phone are not conducive to holding it between your head/ear and shoulder. I bought the 4000 as a remote to my 4210. It was a mistake. The 42XX series will automatically download your adddress book. The 4000 does not have this feature. You will have to input you phone numbers again. The 4200 adds voice dialing and called ID. 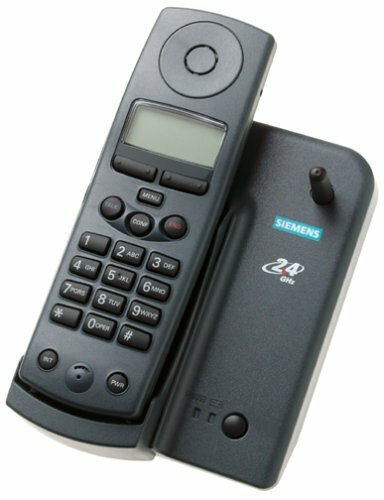 For a basic remote in a Siemens phone network, this phone will be fine. I use mine with a Vonage VOIP (cable) phone system and it works great. It broke my heart to say goodbye to Verizon. NOT! One of the most stylish 2.4 Ghz phone out there! I have been using this phone for almost 2 years now and the only problem I have encountered is with the base charger refusing to charge if the phone is not placed exactly upright. Otherwise, reception is always crystal clear, range is incredibly FAR! I live in second floor, I took my phone to the basement through elevator and the only static I heard is after I got into my car! Every time my friend came to my place the look with awe at this stylish phone. I would recommend this to everyone who wants a quality phone that doesn't have those geeky style in it. 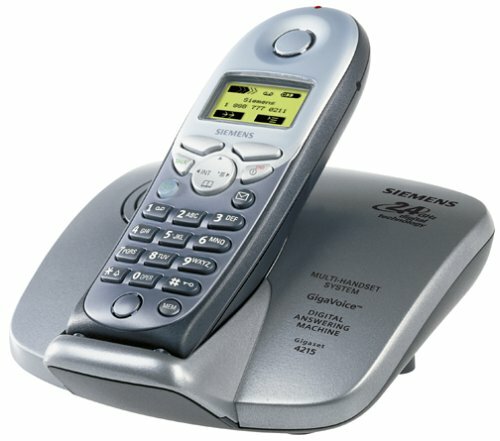 The Siemens Gigaset 2415 is a full-featured cordless phone system with a built-in digital answering machine. The 2415's digital spread technology and full 2.4 GHz operation allow it to offer voice clarity and enhanced security. Because the Siemens Gigaset 2415 2.4 GHz cordless phone is expandable, only the base needs to be connected to a jack. You can plug a total of four handset chargers into standard power outlets, and you can operate all four handsets (Siemens model 2400) simultaneously without doing any additional wiring. For example, while you and another user talk to a third party on an outside line, two other users can talk to each other through the intercom feature on their handsets. You can customize each handset with its own ring tones, personalized directory, and extension name and number. The 2415's full-featured answering system with 22 minutes of memory adds to its versatility. The machine records messages digitally, so there are never any tapes to fuss with, plus you can choose from four outgoing greetings. You can access messages from any Gigaset handset or remotely from any touch-tone phone. Somewhat difficult setup and many options to configure. And don't lose your handset's PIN! If you are worried about hickups, get a newer Siemens model, like the 8000 line. I heard about this phone when I was looking on Ebay for a new cordless with answering machine and caller ID. This phone looked slick and had all the features, but it had also gotten a bunch of bad reviews. I decided to buy one anyway, and another as a backup, since I got it so cheap. The setup was a bit difficult, since you need to manually register the handset to the base, and you need to know the system PIN. If you are locked out, however, Siemens support will walk you through an unlocking procedure. My first positive surprise was that the phone had actually retained all its info on non-volatile flash memory. When I had gotten it running, I could still listen to the messages that the previous owner had gotten months ago, including caller ID. Similarly, the handset still had a lot of phone number stored that the previous owner didn't erase before shipping the phone. Well, I erased that a.s.a.p., but cool feature... no more worries about losing messages to power glitches. A lot of the problems that people report - battery and charging problems - are due to the fact that Siemens didn't solder the charging contacts onto the electronics, they just stuck them onto the circuit board with springs. This creates poor contacts that may fail sometimes after a while. However, for the technically inclined, you can just solder them down and avoid such trouble. Looks like Siemens wanted to simplify assembly here, but sacrificed reliability... The same poor-clip-on-contact problem goes for the handset speaker. And the buttons can get dirty and malfunction, just like a cheap keyboard, since they are these rubber-knob type thingies that press down onto the plain circuit board... Once again, if you manage to *carefully* open your handset, you can just clean the keypad with an alcohol swab, and it works just fine, in case you had trouble. Lastly, one of my two handsets had weird static (garbled my microphone) if I held it real close to the base, i.e. less than one foot. I was able to improve this condition to less than one inch by also replacing the internal antenna (in the handset) with a longer one. This isn't exact science, but it did change the situation for the better. i bought this phone 3 years ago and loved it.wonderful german design.very european.handset comfortable to hold and when touching the ear. (some other phones are painful)the sound is clean and solid. (compared to panasonic)120 name directory.AA batteries is very convenient to replace.then i saw the newer siemens,4015 and 4215.
i loved the 2415 so much that i went and bought both the 4015 and 4215.what i found different!!! contrary to some,describing those new ones as nice looking,i see them very generic design,even though they are made in germany.the 2415 is made in usa,but has an unmistakeable german look.as german as a mercedes. the sound of 2415 is far superior and cleaner.the 4015 and 4215 sound definitely cheaper. the 4215 is meant to be inside your palm.this does not make it more comfortable.please siemens!they even make smaller phones. speaker phone on the 4215 as well on other brands i tried is a joke.it cuts off when you move the phone around!i will not consider a speaker phone feature at this time. the 2415 is solid color,the 4015 and 4215 are painted.they will peel through usage and look ugly.not the 2415 the color is solid through. run and buy the 2415 before it's too late. they are the real german siemens . and for all who gave this model a bad review.i wonder if they did it just to harm siemens. for me i just compared 3 different siemens.and the 2415 is a classic. 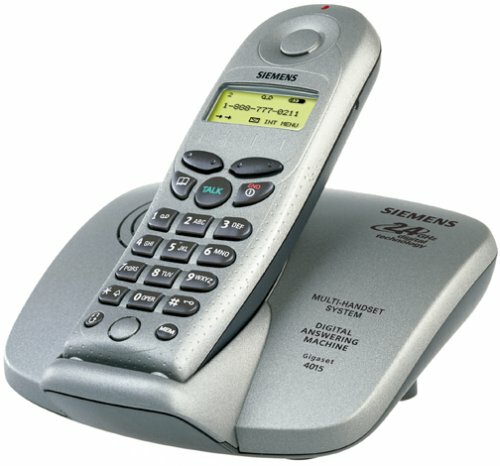 Siemens is a company with a great reputation for hi end equipment, but this phone system is a bad product. On the positive side, the features and functionality of the whole base station idea are fantastic. On the negative side: 2.4 GHz is notorious for microwave interference (I can attest to this), the range was no more than my old 900MHz, callers would daily complain of my voice "digitizing" or "strobing" to the point where I had to get on a hard line phone, the handset is too thin to attempt to cradle between your head and neck. Customer service is commendable, but I sent back every phone including the base set once and am still having problems. Don't buy this phone system. I had the same problems as everyone else. Pretty much out of the box, nobody could understand me b/c it was very garbled. I sent the almost new phone back to siemens and they gave me a very used refurbished one that has similar problems. On the other side, the answering machine, once figured out, had very good sound quality. Overall a big waste of money. The Siemens Gigaset 2410 2.4 GHz cordless phone is an expandable cordless system for active households or home offices. It provides 2.4 GHz technology for clear sound without static or interference from other cordless phones operating at crowded lower frequencies. It also offers digital spread spectrum technology for security against eavesdropping and provides access to a wide range of convenience features. Because the Siemens Gigaset 2410 2.4 GHz cordless phone is expandable, only the base needs to be connected to a jack. You can plug a total of four handset chargers into standard power outlets, and you can operate all four handsets simultaneously without doing additional wiring. For example, while you and another user talk to a third party on an outside line, two other users can talk to each other through the intercom feature on their handsets. You can customize each handset with its own ring tones, personalized directory, and extension name and number. I think this is a phone that you either love or hate. It's like a high performance sports car that has a few quirks, and it's not going to please everyone. 1. Ultra-cool styling. I bought the white version. It has the look and feel of a modern cellular phone, and I love the fact that there's no antenna to break off. The handset is very lightweight, and I can talk comfortably on it for a very long time without resorting to a headset. 2. High security. Unlike the Panasonic 2.4GHz phones, the Siemens' system is based on a European 1.9 GHz technology called Digital Enhanced Cordless Telecommunications (DCET), which stresses clarity and security over distance. It utilizes true Digital Spread Spectrum (DSS) which hops frequencies over 100 times a second. What this means to you is, no one is going to be able to pick up your conversation with a radio scanner, and interference from other phones won't be a problem. 3. Ability to add handsets without additional cabling. This is great if you want to add a phone in a room that has no phone jack. Just place a handset there, and you're done. No wiring to mess with. 4. Gobs of features built in. It has nearly all the features of a cell phone, and then some. These include a phone book, caller ID, handset settings, room monitor, and intercom, just to mention a few. If you're the type that loves to tinker with things (like me), then you'll love the programmability of this phone. 5. A usable headset jack. Unlike some phones I've used in the past, the volume level to the headset is nice and loud so that you can hear your calls clearly. I should mention that while on the headset, all of my calls have sounded just like on a quality corded phone. 1. I have noticed a slight hiss in the background while using the handset. However, I must point out that the volume of my callers is sufficiently loud to comparatively drown out this noise. I only notice it during moments of silence, and it completely disappears when I use the headset. Still, I feel it's the best sounding cordless phone I have ever used. 2. Poor battery life with the included NiCads. This problem is easily solved. I replaced the NiCads with two inexpensive NiMH AA batteries, and now the phone lasts for days on standby and hours talking. I recommend that other marathon talkers do the same, and you might even want to power off the phone when you're not at home to conserve the battery life. 3. Usable range, but not the absolute best I have seen. For all practical purposes, this phone suits me fine. I can take it to my mailbox or the neighbor's house, but I wouldn't go much further with it. The Siemens technology sacrifices distance for clarity and security, and I can live with the tradeoff. 4. Relatively pricey. If you don't need all the fancy features of this phone, there are other good cordless phones available at substantially lower cost. Siemens designed this phone for the high-end market, and it's priced appropriately. 5. The plastic cover over the digital display is strategically located to smudge the oil from your face. A minor annoyance, but I find myself wiping grease from the display after each call. 6. All numbers dialed during a call remains in the call log. I hate this "feature" when I have to make calls where I need to punch in my credit card number, social security number, PIN number, etc. I don't want that info to remain on the phone, especially if other people have access to it. I recommend making those calls on a different phone if security is an issue for you, or set a password on the phone. In short, if you're willing to live with its quirks then you just might fall in love with this phone. However, if you're looking for a no-frills phone without the bells & whistles, you might want to look elsewhere. These phones do not last for more than 2 years. At the end of 2 years, Siemens would like you to buy another one. Do you feel like making money for Siemens just to get a cool phone? I hope not. I have had nothing but reception problems with this system. I have to keep to handsets near me, just in case a bad channel clicks in when I start a conversation. My family members are begging me to by something different, but after spending $300 on a base and a couple of handsets, I am nervous about what to get next. Caller ID works about 50% of the time, and if you have another caller ID phone (I have an AT&T corded) it pretty much cuts that down to no CIDs coming through. Save your money, and hassle, and look elsewhere. Look out - this card is for older versions of Windows only, not Windows XP. Although it's not obvious from the main page for this product on Amazon, Amazon is selling a 2001 version of the Siemens SpeedStream PCMIA 10/100 Ethernet Card (SS1012). As a result, there is no driver for Windows XP included. If you go to the Siemens website, you learn that there IS NO DRIVER for Windows XP for this product. Siemens later came out with a different version of the SS1012, and that different version does have a Windows XP driver. But for this older version sold by Amazon, only the earlier versions of Windows are supported. Wish I'd known that before I ordered this. I purchased the Siemens 2501, 2502 and 2521 Powerline adapters and connected them to the outlets in my home, (which is less than five years old). The setup was easy but the included instruction guide stated little more than "plug it in". The problems began when I installed the included configuration software on my three computers equipped with WINDOWS ME and discovered that the utility program either froze Windows or took close to 2 minutes to start. The SpeedStream Support staff is aware of the problem and told me that "the programmers at Efficient Networks are working on it". The biggest issue I have is that none of the three Powerline products will stay connected for more than 10 minutes! I have tried changing outlets and even tried hooking up the adapters at my friend's house but these things simply refuse to maintain a connection. Bottom line: Unless you enjoy loosing your network connection and having to get up and reset adapters every ten minutes, stay away from Siemens Powerline products...at least for now. We've been using this with our Windows XP system for about a month now. The driver installation was quick and easy, and the physical hookup as simple as could be asked for (short of wireless). Performance has been quite good between our small home network (1 Windows, 1 Mac, and 1 firewall) and the cable Internet service that I use. I don't have any precise measurements but we've been completely happy. We don't communicate between our two home systems (yet) so I can't report anything about that. A previous reviewer mentioned a faulty USB cable coming with the device. I didn't even notice at first that a USB cable was included--it was hidden under a cardboard insert. Followed setup instructions exactly and still didn't get it to work. Documentation is limited. No mention of entering passcodes in instructions. One of the units would not accept the passcode assigned to it. Found 1 bad USB cable included with unit. Units will only work if everything is on the same 110 volt leg of the house wiring.